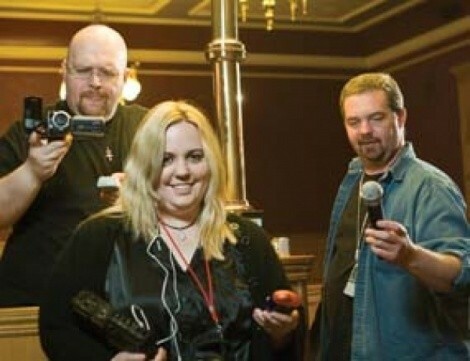 Paranormal investigators from across northern Utah are joining forces in Ogden this weekend, hosting a first-ever convention to exchange information, share resources—and get together for dinner, a beer and some ghost hunting. The vibe at the Mid West Paranormal Conference promises to be like that of any gathering of misunderstood hobbyists who are as enthusiastic about the social aspect of their avocations as they are about the activity itself. Big gatherings are unusual for Utah’s ghost hunters, who typically work in small, separate groups. But they hope this one will allow them to help each other in a pursuit that involves a lot of work and little recognition. They also want to get the word out about exactly what their work entails. “Five years ago, you didn’t tell people what you did. You didn’t tell people you were a ghost investigator. Now, it’s OK to say so,” says Tom Carr, founder of Wasatch Paranormal Investigators and host (with fellow investigator Russ Larsen) of a weekly audio blog called Residual Hauntings Live. Carr and other investigators say the timing of the convention is partly because there’s been an unexplained uptick in paranormal activity during the past year or so. They’re not sure why, and they admit it could just be a result of more technology giving them more ways to capture inexplicable sights and sounds. During the months leading up to the convention, various groups have organized joint investigations. About 20 people from three groups recently gathered at This Is the Place Heritage Park, deploying sophisticated equipment and experienced volunteers among the site’s old buildings. This is what they always do. Then, they wait. Usually, nothing happens—at least nothing anyone can see or hear. They snap hundreds of photos, piercing the darkness with flashes. “When you kill your rods and cones, you know you’re a ghost hunter,” jokes Michelle Lowe, an investigator with Research Investigations of the Paranormal (RIP, for short). Images and sounds often come later, after the researchers spend hours poring over the tapes and photos. The investigators say all the equipment—which for a hard-core investigator can add up to $20,000 or more—is as much to disprove possible sightings as to prove them. “We try to keep everything scientific, but we also have to keep an open mind,” Lowe said. No one knows, of course, what exactly these pieces of evidence represent. The most common feeling among ghost hunters is that “ghosts” are regular people who didn’t quite pass from life into wherever we go after we die, or sometimes spirits that never were mortal. In general, they say, these entities are no scarier in limbo than when they were alive. “We do this all the time, and only once in a great while will we get something really negative, that would try to cause us harm,” Carr said. This Is the Place turned out not to be among the most haunted places in Utah—at least not that weekend. Other spots are notorious, such as the old military buildings at Wendover’s airport, where investigators say they got 125 EVPs (electronic voice phenomena) in one night. Lowe says her scariest experience was in the west desert ghost town of Merkur, where she saw a woman’s face in her camera, then felt a physical force pulling her. “I hadn’t been creeped out like that for years. And then, a flash—and there was nothing there,” she said. People usually get into investigating after their own brushes with the supernatural. They don’t typically charge for their services, which makes it an expensive and time-consuming hobby they do on top of their day jobs. And Utah’s conservative dominant culture is no impediment. Quite the opposite: Many ghost hunters say their beliefs about spirits mesh nicely with Mormon doctrine about where we come from and where we’re going after we die. The investigators chose Ogden’s Union Station for their convention partly because it’s thought to be haunted. They’ll get some investigating in between speakers and seminars. Public buildings make good group outings, but investigators spend much of their time checking out private houses after residents get tired of unwanted spirits. It’s part of their quest to find evidence of the supernatural. Usually, they coach people on how to make peace with their paranormal housemates. Rarely is it possible, or even desirable, to get rid of the spirits altogether. “If you start throwing holy water at a Buddhist ghost, it’s not going to help,” Lowe says. Saturday, Aug. 16 from 9 a.m.–9 p.m.